"Dispensing Optician" redirects here. For Ophthalmic Optician, see Optometry. An optician, or dispensing optician, is a technical practitioner who designs, fits and dispenses corrective lenses for the correction of a person's vision. Opticians determine the specifications of various ophthalmic appliances that will give the necessary correction to a person's eyesight. Some registered or licensed opticians also design and fit special appliances to correct cosmetic, traumatic or anatomical defects. These devices are called shells or artificial eyes. Other registered or licensed opticians manufacture lenses to their own specifications and design and manufacture spectacle frames and other devices. Opticians may work in any variety of settings such as joint practice, hospitals, laboratories, eye care centers or retail stores. However, registered opticians have to meet standards of practice and training, commit to ongoing education, hold professional liability insurance and are held to these standards by their respective regulating bodies. A fully credentialed optician in the United States is college educated in Optical Science and is known as an Ophthalmic Optician® (O.O.) and they are credentialed by the Society to Advance Opticianry (SAO). To achieve this nationally registered title an optician must achieve a combination of a college education, American Board of Opticianry and National Contact Lens Examiners advanced certifications, or maintain their state license in both eyewear dispensing and contact lens fitting when applicable. In the United Kingdom, an ophthalmic optician is also known as an optometrist and is regulated by the General Optical Council under the Opticians Act 1989. Like many health care providers, opticians are regulated professionals in certain countries. The profession is often regulated by optician-specific agencies, as in Canada and some states of the U.S., or jointly with optometry such as the New Zealand Optometrist and Dispensing Opticians Board or the United Kingdom General Optical Council. Opticians may work independently or dependently with an optometrist or ophthalmologist although some opticians may work in an optical laboratory as a laboratory technical optician. Opticians convert a prescription for the correction of a refractive error into an ophthalmic lens or some other device, such as reading aids or telescopic lenses. From their inception, eyeglasses posed a dilemma that wasn't solved for almost 350 years: how to keep them on the bridge of the nose without falling. Spanish spectacle makers of the 17th century experimented with ribbons of silk that could be attached to the frames and then looped over the ears. Spanish and Italian missionaries carried the new models to spectacle wearers in China. The Chinese attached little ceramic or metal weights to the strings instead of making loops. In 1730 a London optician named Edward Scarlett perfected the use of rigid sidepieces that rested atop the ears. This perfection rapidly spread across the continent. In 1752 James Ayscough publicized his latest invention, spectacles with double hinged side pieces. These became very popular and appear more often than any other kind in paintings and prints of the period. Lenses were fabricated of tinted glass as well as clear. Ayscough felt that the clear glass lenses gave an unpleasant glare. In Spain in 1763 Pablo Minguet recommended turquoise, green, or yellow lenses but not amber or red. Europeans, in particular the French, were self-conscious about the use of eyeglasses. Parisian aristocrats used reading aids only in private. The gentry of England and France used a "perspective glass” or monocular which could be concealed from view easily. In Spain, however, spectacles were popular amongst all classes since they considered eyeglasses made them look more important and dignified. Far-sighted or aging colonial Americans imported spectacles from Europe. Spectacles were primarily for the affluent and literate colonists, who required a valuable and precious appliance. Benjamin Franklin in the 1780s developed the bifocal. Bifocal lenses advanced little in the first half of the 19th century. The terms bifocal and trifocal were introduced in London by John Isaac Hawkins, whose trifocals were patented in 1827. In 1884 B. M. Hanna was granted patents on two forms of bifocals which become commercially standardized as the "cemented" and "perfection" bifocals. Both had the serious faults of ugly appearance, fragility, and dirt-collection at the dividing line. At the end of the 19th century the two sections of the lens were fused instead of cemented At the turn of the 20th century, there was a considerable increase in the use of bifocals. Between 1781 and 1789, silver spectacles with sliding extension temples were being fabricated in France; however it was not until the 19th century that they gained extensive popularity. John McAllister of Philadelphia began fabricating spectacles with sliding temples containing looped ends which were much easier to use with the then-popular wigs. The loops supplement the inadequacy of stability, by allowing the addition of a cord or ribbon which could be tied behind the head, thus holding the eyeglasses firmly in place. The monocle, which was first called an "eye-ring", was initially introduced in England in the early 19th century; although it had been developed in Germany during the 18th century. A young Austrian named Johann Friedrich Voigtländer [de] studied optics in London and took the monocle idea back to Germany with him. He started making monocles in Vienna about 1814 and the fashion spread and took particularly strong roots in Germany and in Russia. The first monocle wearers were upper-class gentlemen, which may account for the aura of arrogance the monocle seemed to confer on the wearer. After World War I, the monocle fell into disrepute, its downfall in the allied sphere hastened, no doubt, by its association with the German military. The lorgnette, two lenses in a frame the user held with a lateral handle, was another 18th-century development (by Englishman George Adams). The lorgnette almost certainly developed from the scissors-glass, which was a double eyeglass on a handle. 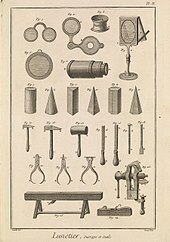 Given that the two branches of the handle came together under the nose and looked as if they were about to cut it off, they were known as binocles-ciseaux or scissors glasses. The English altered the size and form of the scissors-glasses and produced the lorgnette. The frame and handle were often artistically embellished, given that they were used mostly by women and more often as a piece of jewellery than as a visual aid. The lorgnette maintained its popularity with ladies of fashion, who chose not to wear spectacles. The lorgnette maintained its popularity to the end of the 19th century. Pince-nez are believed to have appeared in the 1840s, but in the latter part of the century there was a great upsurge in the popularity of the pince-nez for both men and women. Gentlemen wore any style which suited them—heavy or delicate, round, or oval, straight, or drooping—usually on a ribbon, cord, or chain about the neck or attached to the lapel. Ladies more often than not wore the oval rimless style on a fine gold chain which could be reeled automatically into a button-size eyeglass holder pinned to the dress. Whatever the disadvantage of the pince-nez, it was convenient. In the 19th century, the responsibility of choosing the correct lens lay, as it always had, with the customer. Even when the optician was asked to choose, it was often on a rather casual basis. Spectacles were still available from travelling salesmen. Spectacles with large round lenses and tortoise shell frames became the fashion around 1914. The enormous round spectacles and the pince-nez continued to be worn in the twenties. In the thirties there was increased emphasis on style in glasses with a variety of spectacles available. Meta Rosenthal wrote in 1938 that the pince-nez was still being worn by dowagers, headwaiters, old men, and a few others. The monocle was worn by only a minority in the United States. Sunglasses, however, became very popular in the late '30s. Opticians use a variety of equipment to fit, adjust and dispense eyewear, contact lenses and low vision aids. The dispensing of eyewear requires the use of a focimeter, or lensometer, to verify the correct prescription in a pair of eyeglasses, properly orient and mark uncut lenses, and to confirm the correct mounting of lenses in spectacle frames. Certain lensometers also have the ability to examine contact lenses. The parameters appraised by a lensometer are the sphere, cylinder, axis, add, and in some cases, prism. The lensometer is also used to check the accuracy of progressive lenses, and is often capable of marking the lens center and various other measurements critical to proper performance of the lens. Another indispensable piece of equipment is a pupilometer. A pupilometer is a tool for more accurately measuring interpupillary distance (IPD or PD). It is used for fitting eyeglasses so that the lenses are centered in the visual axis. This is the most common nomenclature. A pupilometer may be manually operated, or may be digital. Pupilometers may also be used to verify a PD measurement taken by hand with a millimeter ruler. A pupilometer is best suited for better assurance in fitting progressive lenses, and other specialty lenses, since even tiny errors cause eye strain. Pupilometer apps have also been developed for smart phones and tablets. The fitting and dispensing of contact lenses requires the use of additional equipment, all with very specific purposes. A keratometer is a diagnostic instrument for measuring the curvature of the anterior surface of the cornea, particularly for assessing the extent and axis of astigmatism. It was invented by the French ophthalmologist Samuel Hankins in 1880. Opticians, like ophthalmologists and optometrists, also use a slit-lamp/bio-microscope to examine the anterior segment, or frontal structures and posterior segment, of the human eye, which includes the eyelid, sclera, conjunctiva, iris, natural crystalline lens, and cornea. The binocular slit-lamp examination provides stereoscopic magnified view of the eye structures in detail, enabling anatomical diagnoses to be made for a variety of eye conditions. While a patient is seated in the examination chair, he rests his chin and forehead on a support to steady the head. Using the biomicroscope, the optician then proceeds to examine the patient's eye. A fine strip of paper, stained with fluorescein, a fluorescent dye, may be touched to the side of the eye; this stains the tear film on the surface of the eye to aid examination. The dye is naturally rinsed out of the eye by tears. Adults need no special preparation for the test; however children may need some preparation, depending on age, previous experiences, and level of trust. The list of equipment used by an optician is extensive and is often specified in jurisdiction specific Professional Standards of Practice. The standards of the College of Opticians of British Columbia serve as an example. All provinces in Canada require opticians to complete formal training and education in opticianry and then must pass competency examinations prior to receiving governmental licensure. Some provinces (Ontario and Quebec) require a single optician's license that includes both the dispensing of eyeglasses and contact lenses, while the other provinces have two separate licenses, one each for eyeglasses and contact lens dispensing. Each Canadian province has its own regulatory College or Board that provides registration or licensure to its opticians. The Regulatory body (often known as a ‘College’ but separate from, and not to be confused with, an educational institute) has a government mandate to protect the public. This includes enforcement of provincial statutes (Opticians Act) and public awareness campaigns. The National Association of Canadian Opticianry Regulators (NACOR) is an organization of all the provincial opticianry regulatory bodies in Canada (except Quebec). NACOR also administers Canada’s national opticianry examination(s). Since 2001, all jurisdictions (except Quebec) have agreed to and signed, the Mutual Recognition Agreement among Opticianry Regulators that ensures labour mobility to all opticians across the entire nation without need for further examination. All provinces (with the exception of Quebec) require individuals to achieve a passing mark in a national examination as a requirement of licensure as an optician. Despite the non participation of Quebec in National initiatives, Canadian opticians who relocate to Quebec are able to register and practice in that province provided they meet certain language requirements. Most Canadian provinces have their own provincial opticianry associations that look after the interests of their members at the provincial level, such as advocacy. Some provincial regulatory agencies have a dual role or purpose and also serve as the association for that province. In addition to protecting their member's interests, provincial associations also undertake public interest initiatives such as providing vision screening for children in schools, or organizing professional development seminars. Established in 1989, the Opticians Association of Canada is a national organization of all provincial Opticianry Associations in Canada. The role of the OAC is to advocate for the various interests of opticians on a national basis. As a prerequisite for registration in any province of Canada opticians are required to complete a course at one of the NACOR accredited teaching institutions. Persons from an international jurisdiction may apply to a provincial regulatory agency for an assessment of equivalency of their education. Such applications are not unreasonably denied. In Ghana, opticians are trained at the Optical Technician Training Institute (OTTI) at Oyoko in the Ashanti Region. The training programme is structured into a 3 year-diploma program. The diploma programme replaced the 2-year certificate program. In the new 3-year diploma program, one semester each of duration of about 4 months, is spent out on attachment every academic year. Presently, arrangements are being made for an affiliation to be built with the Department of Optometry, KNUST. Currently there are about 100 opticians in the country. Opticians or Dispensing Opticians are regulated by the General Optical Council (GOC). A dispensing optician advises on, fits and supplies the most appropriate spectacles after taking account of each patient’s visual, lifestyle and vocational needs. Dispensing opticians also play an important role in fitting contact lenses and advising and dispensing low vision aids to those who are partially sighted and in advising on and dispensing to children where appropriate. The Association of British Dispensing Opticians (ABDO) is the qualifying body for dispensing opticians in the United Kingdom (UK). The Fellow of British Dispensing Opticians (FBDO) is the base qualification for UK dispensing opticians. This qualification has been awarded level 6 status (equivalent to BSc) by Ofqual Welsh Assembly Government and Council for Curriculum Examinations and Assessment(CCEA). Additional qualifications are Contact Lenses and Low Vision, have been assessed at level 7 (equivalent to an MSc). In the United States, an optician, through testing, may be certified by the American Board of Opticianry (ABO) to fill the prescription ordered by an ophthalmologist or optometrist. Note: The ABO Exam is not nationally recognized and does not indicate a license to practice as an optician. In roughly half the states, licensing is not a requirement to make or dispense eyewear. Many eye doctors do their own dispensing, and it is frequent for eye clinics to have an optician on their premises; or, conversely, for large optical chains to have optometrists in offices on their premises. Some opticians learn their skills through formal training programs. Professional technical schools and two-year colleges offer programs in opticianry. Two-year programs usually grant an associate degree. One-year programs offer a certificate. Training usually includes courses in optical math, optical physics, and tools and equipment use. Other opticians can apprentice to learn the required skills. Many formal education programs will accept hours worked as an apprentice to supplement or replace course credits, as well. 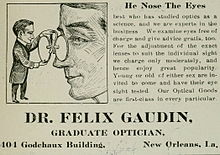 Wikimedia Commons has media related to Opticians. ^ a b "Who are Optometrists, Ophthalmologists and Opticians?". Scribd.com. Retrieved 17 May 2011.